Happy 2013. I hope this one is going to be a better one. 2012 was a bit of a struggle in my world. As a writer, blogger, columnist, with a fairly low profile, (i.e. I’m not on the TV/front pages etc…) I have to work double hard to make a living from doing what I do best. At least, it’s what I think I do best; because other than dreams of running off with a rock star when I was in sixth form, there’s no other way I’ve ever imagined spending my life, than writing. I have a genuine passion for creating copy and on top of that, I’m lucky enough to enjoy the subjects I write about; those being property, fashion and travel. I was first published in a local paper in 2006. It was a story about a local man who had opened an exhibition of his photographic work in New York. I wasn’t paid for the piece, nonetheless, I was over the moon; my mum was so proud that she still has the original cutting framed and up in the office at home. A few (long) months later, after much searching, I landed a job in a small publishing house, writing property and lifestyle/fashion features for magazines. That was 6 and a half years ago… since then I started my blog, was made redundant and began writing as a freelance journalist. I utterly love the writing part of my job; sometimes I can’t actually believe that it’s what I do, and that it makes me happy. The happiness swiftly fades when I look at my bank balance though; the truth is I’m often approached to do a heck of a lot of writing for nothing, or next to nothing. As my flatmate often jokes, “There are children in third-world sweatshops, making trainers that get paid more than you”… I presume (pray) that this isn’t true, but if I actually worked out how much money I get for the hours I spend working on copy for other people, I may actually be inclined to agree with him. The truth is that working for less than you deserve gives you nothing but a lack of respect and a lack of disregard, it won’t raise your profile, (though it may add to your CV should you have no experience). It transpires then, that working hard and being nice to people won’t get you on your way to doing what you love for a living. Only shameless self promotion will get you anywhere. I know I’m not the brash, obnoxious wannabe I’ve met so many times in the fashion game; (often full of delusional self belief and lacking in talent and integrity) – when working at a magazine, I was unfortunate enough to have submitted to me, a fashion feature, by a future TV personality. Alas the copy was never published as it was in fact copied, direct from Topshop.com – Yet after years of working 12 hour days, creating original (and published content), I am still struggling to live my dream, yet said plagiarist is very much living theirs. So do I blame the people doing the hiring? Hell no. People under pressure will take the easiest route. Why spend effort looking for talent, when you have a willing and flirtatious wannabe with an open mouth, ready to convince you that they are just what you need instead? Why search through all the applicants to find a slightly shy, yet outstanding applicant, when you can have your ego massaged by listening to sycophantic compliments? Better still, how can you refuse your boss/golf partners/neighbours’ kids? Ah nepotism, my old enemy. Does hiring the person who stamps his feet the hardest make for a better end product and a more enjoyable working environment? Possibly? Is it really about being pushy or having the right relatives, or does luck play a part? Possibly; some of the most incredible writers are published every day, they can’t all have daddy’s pals in their pocket can they? So should I blame myself then? I have quiet confidence in my ability, so why then do I continue to work for less than I should, somehow contradicting that self belief. I was speaking to a fellow writer/blogger recently, she said it succinctly “I no longer work for free”. But she said it with such confidence I was taken aback. I was inspired, I wanted to stand up and say, “me neither! !” Except I didn’t, couldn’t. Debenhams announced its latest fashion designer collaboration at the beginning of November, along with it, two images. Both maxi dresses, one floral the other monochrome stripes. The new collaboration is with Ossie Clark, the brand. Now owned by Alison Mansell Ltd Ossie Clark has St. Martins Collage of art graduate, Nicholas Georgiou, is at the design helm – Ossie Clark the man, was tragically murdered in London in 1996. Ossie Clark and his wife Celia Birtwell defined the King’s Road style in the late 1960’s. Together they pushed the boundaries of fashion and print-styles and created ethereal, flowing collections that epitomised the psychedelic era. Longer, yes, what I dreamed of? I dunno. But with 90 stylish pieces still to view I can’t call it. The print on those trousers is pretty fabulous, and will definitely fit in with the rest of my wardrobe. I’m sitting here covered in green clothing dye having failed to save a 50’s ball gown from the perils of mildew stains… 😦 Oh Vintage, you contrary vixen. 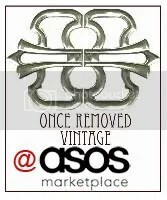 As wonderful as vintage is, I do sometimes wonder why I, we, don’t just buy on the high street; it’s so much simpler. Anyway, last week I went to the New Look SS’13 preview… Here are a few of the stand out pieces, check the lattice work / cut out leather bags, the pretty pale salmon shift, peplum dresses, hiiiiigh heels and stunning summer wedges. New Look manages to grasp the trends and styles of the current designer fashion trends and give it a unique wearable edge, by interpretation rather than simply copying what’s going on, on the runway. So it’s time once again to dream about next season and decide which pieces and trends are going on our wish list over the next couple of months. Carnaby Street in the city’s West End epitomised London’s swinging sixties; it was an exciting mix of independent clothing shops and boutiques, including Mary Quant and the infamous I Was Lord Kitchener’s Valet, a shop selling vintage and ex-issue military clothing. Formerly of Portobello Road, the shop helped popularised the wearing of ex-military clothing as fashion pieces. ‘They’ say Jimi Hendrix bought this Royal Hussars jacket at the shop… along with another jacket that according to this website, he was ordered to remove by a group of policemen, as it was disrespectful to its previous wearers(!). Its not just fashion that made the street so notorious; the musical connections to Carnaby Street are endless; The Kinks, The Stones, Paul Weller and The Who, have all been photographed there – often by Philip Townsend. More recently Liam Gallagher opened a Pretty Green store there, and The Stones have made a spiritual return this month opening a pop up store to celebrate their 50th anniversary. It’s basically a Rolling Stones Carnaby Street Christmas, the street’s arches have been decorated with Sir Mick’s red lips, and Stones-emblazoned gold discs have replaced more traditional festive baubles… The group also has its own store on the street, selling everything from Stones-inspired fashoin to posters and other pop memorabilia. At one end of Carnaby Street is a rather spectacular Tudor Revival department store (c. 1920), which was purpose built, (from the timbers of two ships) as the home of Liberty‘s London. Liberty is famous for producing fine printed fabrics, from satin to silk crepe de chine, wool to cotton jersey. Incidentally it was its archive of Art Nouveau designs that enjoyed popularity in the 1960’s when the trend resurfaced. As a child, I remember having adorable dresses made for me from Liberty fabrics. I also remember visiting the store, it is incredible. With its rows upon rows of ribbons and yarn, fabrics and buttons; dark wooden floors, shiny old lifts and painted ceilings. The best view is from the wooden balcony on each floor, which allowing you to view the whole store from floor to ceiling. So a little touch of that Tudor-inspired London fashion has popped up in Arnotts this week. Rather nicely, Liberty‘s founder Arthur Lasenby Liberty was born in 1843, the same year that Arnotts was established.